tornadoes, blizzards and floods are making the already miserable weather of Britain more unpredictable. Now, scientists are holding global warming responsible for the disasters, the most recent being the flash floods that ravaged many parts of the country. The weather crisis being faced by Britain is a result of mankind's "arrogant disregard" for the delicate balance of nature, said Prince Charles recently. "We have to find a way of ensuring that our remarkable and seemingly beneficial advances in technology do not just become the agents of our own destruction," he added. The country's deputy prime minister John Prescott has also confirmed the link to global warming. Warning that extreme weather conditions would become more frequent because of global warming, he said, "The storm should be a wake-up call for everyone." Prime minister Tony Blair was also quoted by the Washington Post as saying that the country needs "to work to deal with the issue of climate change". Scientists commissioned by the European Union have anticipated a dramatic change in the continent's climate over the next century, as emissions of greenhouse gases, such as carbon monoxide, continue unabated. Britain is in the grip of the worst floods since 1947. Official figures report that three people have died so far, while thousands have been affected. Many of them have been evacuated from their homes. Weather forecast indicate that the situation could only get worse in the coming days. Heavy rains have engulfed much of the country. Southern England is the most affected, with conditions in Hampshire and West Sussex being among the worst. Other areas that have been put on alert by the country's environment agency include Kent, parts of Greater London, Hertfordshire, parts of Wiltshire, parts of Dorset, parts of south west Wales and Northamptonshire. More than 100 millimetres of rain were recorded in some areas. A record number of 45 severe flood warnings across 41 rivers have been issued. According to the agency's officials, the warnings mean imminent danger to life and property. 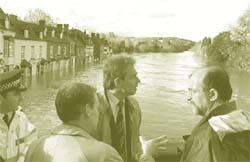 Rivers in Yorkshire, northern England and the river Severn in the west are the main concerns for the authorities. In Dover, on England's southern coast, 10,000 families were told to boil drinking water after suspicions about contamination rose. In the counties of Surrey, Sussex and Kent more than 21,000 homes have been left without electricity after power lines were torn down in the storm. Many cities are virtually cut off from London because of continuing disruption of train services. Much of Britain's rail network was brought to a standstill. A spokesperson for London's Heathrow Airport said that many flights have been delayed or cancelled because of high winds. Road travel in Britain has also slowed to a crawl as the roads are blocked by falling trees. Large sections of the M25 highway, circling London, were closed as drainage channels failed to cope up with the sheer volume of water. "Recent figures show that countrywide the total number of properties flooded was 4,000," says John Harman, chairperson of the environment agency. Officials in the city of York said its flood defence systems had protected many historic monuments from serious damage. The London Chamber of Commerce estimated that up to 50 per cent of staff failed to report to work at some offices in London costing the economy about us $143 million in lost output. The British government is planning to spend us $75 million to combat the situation. "The disruption caused by flooding and strong winds has exposed shortcomings in emergency planning and weakness in infrastructure," Prescott was quoted as saying in the Financial Times . "Our infrastructure should be robust enough to withstand the kind of weather we have just experienced," he suggested. "There is growing evidence that the pattern of weather around the world is increasingly stormy and extreme. Therefore, in the long run, we have to evolve workable solutions to deal with these problems on not just a national level, but on an international level. We have to properly protect people against the impact of floods and work to deal with the issue of climate change," said Blair.